In August, area firefighters from multiple agencies participated in Grain Engulfment Rescue Training. 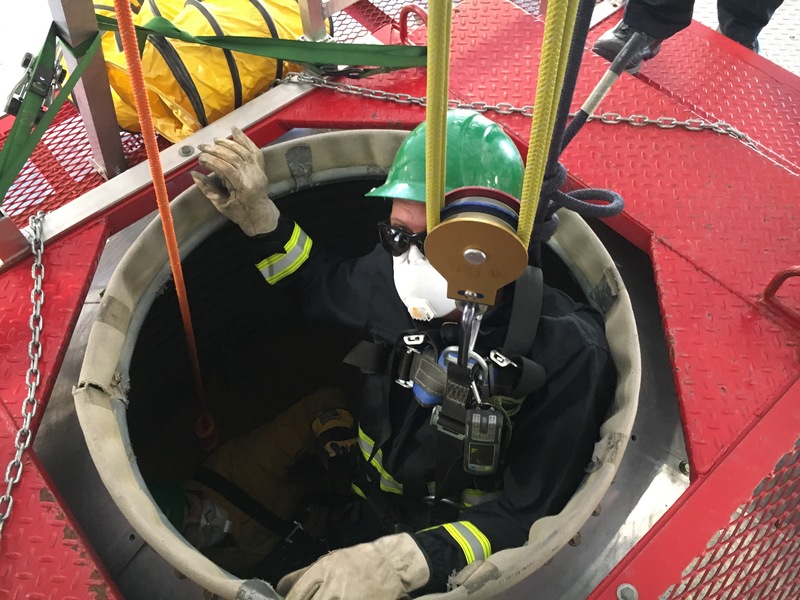 The course and the University of Missouri Fire & Rescue Training Institute’s (MUFRTI) Grain Engulfment Rescue Training simulator, further prepared our local emergency responders to effectively rescue a trapped person from a grain bin. Grain engulfment is a real risk for farmers and industry workers. In 2016, it took the lives of 14 people. Though some have been fortunate. In 2015, Dennis Schneider of Corder, MO hopped into a grain bin to take a look at his corn. He quickly sank, eventually up to his neck as he struggled to get out. Fortunately, Schneider was able to call for help and was rescued by emergency responders after an hour and a half entrapment. As a person sinks in the grain and struggles to get out, the grain packs in tighter and tighter and the person eventually can’t move. Some who’ve survived liken the experience to having all or part of their body encased in concrete. MUFRTI’s training simulator is a tool used to safely train firefighters in initial rescue operations, hazards and proper techniques. In a controlled environment, students enter a grain bin and become entrapped while other students perform rescue techniques learned during the course. Lincoln County, Hawk Point, Wright City, Warrenton, and Marthasville Fire Protection Districts sincerely thank MUFRTI and our course sponsors for making this training possible.